The stagnation of Myanmar’s ongoing peace process is well known, which has started out in 2011 by the Union Solidarity and Development Party (USDP)-led Thein Sein regime. The peace process is taken over by the National League for Democracy (NLD) government headed by Aung San Suu Kyi in 2016, following her party’s landslide election victory in November 2015. But heightened military offensives by Tatmadaw or Myanmar Army in ethnic states, particularly in Shan and Kachin States, and disagreements over how to go about to conduct the peace negotiation process have contributed to the lack of progress that ushered in the stagnation. The recently held Union Peace Conference – 21stCentury Panglong (UPC-21CP), which took place in Nya Pyi Taw from July 11 to 16, was seen as deliberate gathering to save the peace process and keep it alive, that was unable to be convened for more than a year. According to the procedure UPC-21CP has to be held every six months. However, this might be changing as China has weigh in enthusiastically and heavily so that negotiation and eventual reconciliation could be restarted and move forward rapidly, in order its One Belt One Road (OBOR) or Belt and Road Initiative (BRI) economic program could be implemented. 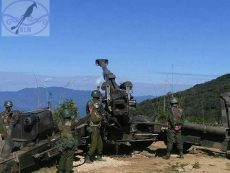 Even though the Chinese Special Envoy Sun Guoxiang recently said that China does not have its own interests in supporting Myanmar’s peace process, its various officials including him, have time and again, reiterated that in order to realize the Myanmar’s portion of the BRI, it needs to overcome the internal armed conflict along the China-Myanmar border and the whole country. China has been donating one million USD yearly for the past three years to Ceasefire Joint Monitoring Committee – Union-level (JMC-U) and last year it donated 500,000 USD, according to JMC-U Chairman General Ya Pyae. He said that the peace process is very important for successful transition and peacefulness of the two countries border. Besides according to the Myanmar government’s request, China has been mediating constructively so that political negotiation could take place between the Nationwide Ceasefire Agreement (NCA) non-signatory Ethnic Armed Organizations (EAOs) and the government. “Other than that, through political negotiations national unity could be implemented and sub-national self-administration and the country’s development could be achieved within the bounds of 2008 Constitution,” stressed the Chinese Ambassador to Myanmar Hong Liang. Indeed, the recently held UPC-21CP was attended by the Federal Political Negotiation Consultative Committee (FPNCC) also popularly known as the Northern Alliance, although just the opening ceremony and not the other discussion meetings that followed. Members of the FPNCC later met the Commander-in-Chief Min Aung Hlaing, his deputy Gen Soe Win in two groups separately and the same procedure was also applied when meeting the State Counselor Aung San Suu Kyi. The FPNCC left home on July14. Reportedly, the FPNCC told the government that it be allowed to make proposal for the amendment of the NCA and retain the right to withdraw from it when it decides to do so for any reason in the future. OBOR or BRI, announced in the year 2013, is comprised of the ‘Silk Road Economic Belt’ and the ‘21st Century Maritime Silk Road’, which together they will connect more than 65 countries making up over 62% of the world’s population, around 35% of the world’s trade and over 31% of the world’s GDP. It will take the form of a series of highways, railways and ports as well as facilities for energy, telecommunications, healthcare and education. The initiative includes 6 international ‘corridors’ and the ‘21st Century Maritime Silk Road’. These are: (1) ‘The new Eurasia land Bridge’, (2) ‘The China-Mongolia-Russia economic corridor’, (3) ‘China-Central Asia-West Asia economic corridor’, (4) ‘China-Indochina Peninsular Economic Corridor’, (5) ‘China- Pakistan Economic Corridor’, (6) ‘Bangladesh-China-India-Myanmar Economic Corridor’(BCIM), this corridor is a hybrid (BCIM) or amphibious route. 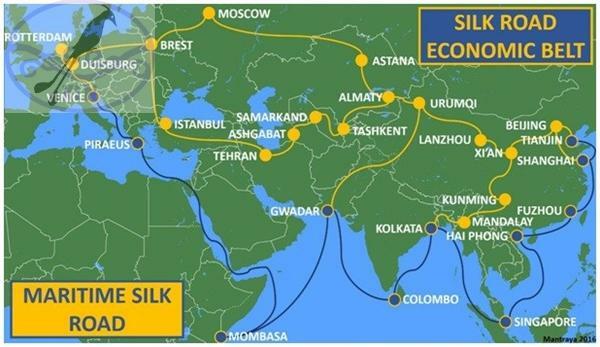 (7) Maritime Silk Road connecting Coastal China to the Mediterranean via Singapore-Malaysia, the Indian Ocean, the Arabian Sea and the Strait of Hormuz. Myanmar as part of the China Myanmar Economic Corridor (CMEC), major roads and railways are being proposed to link China’s Yunnan province with Myanmar’s major cities. A report citing a Myanmar official said that China and Myanmar have reached a “15-point MoU” was reported by Observer Research Foundation on July 11. Accordingly, the corridor will run from Chinese Yunnan province to Mandalay in central Myanmar and then south to Yangon and west to Kyaukpyu SEZ forming a “Y-shape” corridor involving basic infrastructure, construction, manufacturing, agriculture, transport, finance, human resources development, telecommunications, and research and technology to develop the CMEC. “For Beijing, the Kyaukpyu project is a key component of the BRI. Except for the oil and gas pipelines linking the Bay of Bengal to China through Myanmar, most of the Chinese mega-projects in Myanmar hang in a limbo. This may not only create tensions in China-Myanmar relations, but also create hurdles for the development of China’s BRI projects through Myanmar,” wrote the report. Indeed, Myanmar’s angst for “dead trap” or huge financial burden, taking cue from Sri Lanka and Ethiopia that are reeling under such investment, is apparent, especially the Kyaukpyu port, even though Myanmar’s Union Minister for the Ministry of the Office of the Union Government and the Chairman of Myanmar’ Investment Commission Thaung Tun, dismissed the fear of a “debt trap”. Other than that, China is also seriously concern about the implications of the troubled China-Myanmar borderlands on the mega-infrastructure projects under the BRI scheme, added the report. The government is faced with a dilemma of whether to rely on China to fend off the UN and international anger and the looming more possible sanctions, which could include more targeted individual sanctions on the security apparatus top brass, or re-approach the West by adhering to the universal human rights norms and accommodation of the repatriation of a million or so Rohingya that have fled to the Bangladesh over the years. Again, agreeing to mega projects like deep sea port Kyaukpyu and railway tracks across the country from south of Myanmar to China’s Kunming have never been popular with the people and go against the public interest, which the government wants to avoid. As for China, it has to make sure that peace prevail along the border and the whole country, so that OBOR can be implemented. It has done everything in its power to make its proxy-like FPNCC to go to Nay Pyi Taw and attended the UPC and even met the Commander-in-Chief and State Counselor. Reportedly, further communication to overcome the hurdles were said to be in the pipeline. But whether the efforts of China in trying to link the Myanmar’s peace process to its OBOR ambitious scheme successfully is the question that remains to be seen.